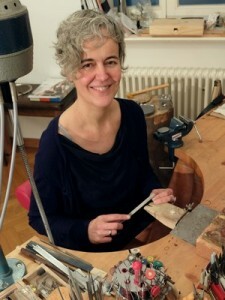 Goldsmith Katrin Detmers moved into Auguststraße 85 with her workshop in 2011. She is on site usually Tuesday and Thursday 3 to 7 p.m. and by appointment. She appreciates to advise you personally on her own pieces of jewellery, which are available at the gallery and at her onlineshop or on custom made production. More informationen about Katrin Detmers at: www.katrin-detmers.de.